Please join us for an evening of networking with fellow alumni and students, sharing professional experiences and connecting with friends. Speak with Alumni from various industries, gain insights, make connections and receive career advice. Transportation: For current students, a free charter bus will be provided to transport guests to and from the event. Pick up and drop off will happen outside of the Student Centre, near Parking Lot C on main campus. Commerce Student Registration – Please CLICK HERE to register. Registering using this link will hold your spot on the bus. 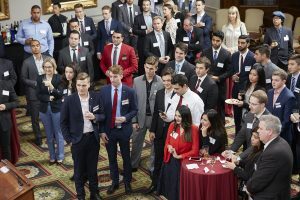 One thought on "Commerce Alumni & Student Networking Reception"
Will MBA students be attending this event? Looking for future recruits for our company.